I woke up this morning to Katja’s rummaging in the bedroom. I told her yesterday that I’m taking a yoga free day today, but she wants more yoga. She informed me that it’s raining and that our planned trip to Intramorus (the old town) is probably not going to happen. Let’s plan something else, then. As Katja went out the door I just rolled over and went back to sleep. I got a good hour more before getting up and about. Then it struck me, I have written about Lapu-Lapu several times, and even promised that the story was to come. Time to honor that promise. 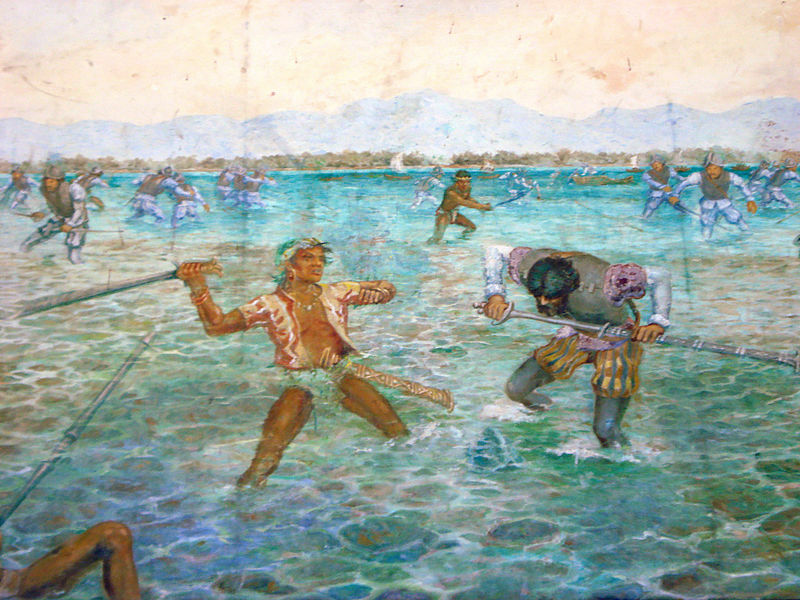 Lapu-Lapu was a leader in the region that first fought the Spanish invasion. The island Mactan is located just outside of Cebu. 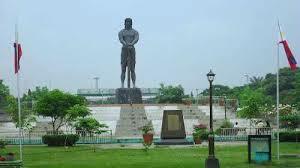 Still, he’s more famous for having disposed of the Portuguese explorer Magellan when he came to these waters in 1521. When Magellan, in service of the Spanish king, came to the Philippines there where two datu’s (head of tribe) in the region where he landed. One of them, datu Zula, paid tribute to the Spanish king – Lapu-Lapu refused. Upon this refusal Magellan went with armed men to handle the situation. About 50 people in heavy Spanish armor, wading in through the waves towards the shore, and intimidating the locals who counted (estimated) 1500 warriors – a clear formula for success, right? Magellan were wounded and poisoned by an arrow, and when calling the retreat the locals understood he was the captain and charged even harder to take him out. The story is much larger that this, as it includes politics, religion and a different structured society that most countries operate with today. Even Lapu-Lapu’s name is under questioning as it may have been more local twists to it, or a part of a longer name. He is depicted in the official badge of the Philippine National Police, and there is a large statue of him in Rizal park (named after another hero). I think that the Lapu-Lapu in the park looks Korean. The statue was once a gift from the Koreans to the Philippines. It was given as a token of respect to the Filipinos that died during the Korean war. A lot of Filipinos entered that war to fight for the freedom of their neighboring country. For us FMA practitioners, Lapu-Lapu is “The Man”. Taking on a more modern armed forces with the weapons we now strive to master, but for here in the Philippines it’s obviously not that easy. He’s got a good place in Rizal park, but I find a lot of writing in my quick research on the guy that shows “it’s complicated” – to borrow an expression from Facebook. Credit for this info is to be (mainly) given to Wikipedia. Oh, and to my FMA friends out there that pronounce Kampilan with a emphasis on “lan”, as it is pronounced here in the Philippines it is with the emphasis on the “i”. Katja came back from yoga bearing gifts in the form of coffee. We had breakfast together and are presently just chilling in the room, watching the rain and catching up on news from home. We are going to the National Museum afterwards to see the recorded history of this diverse country. At the same time I’m really hoping the rain will stop before our training with Grandmaster Rodel tomorrow morning at 06:00 in the park. Gonna be wet and cold otherwise. When push came to show we didn’t go to the museum. 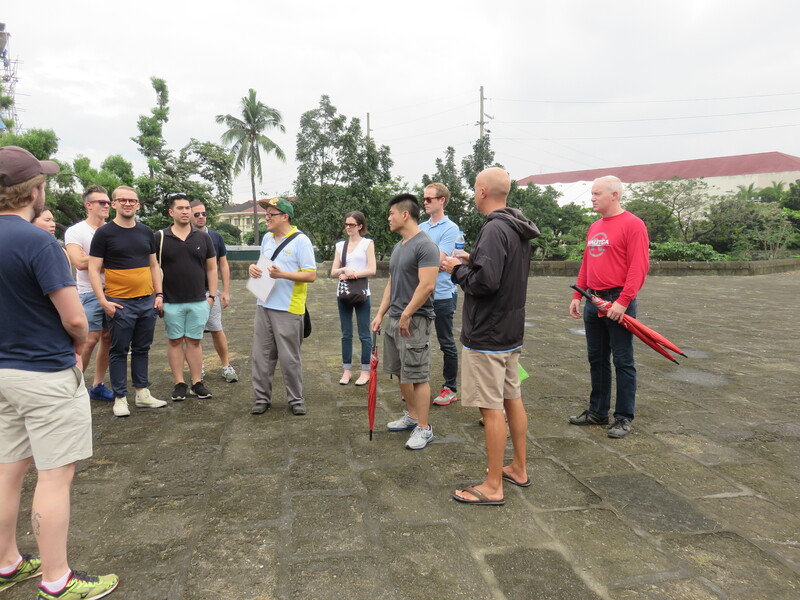 The rain stopped and we went to Intramuros as we’d found a guided tour we could join. Again with the taxis, but finally we got one to take us there and we made it with 2 minutes to spare. 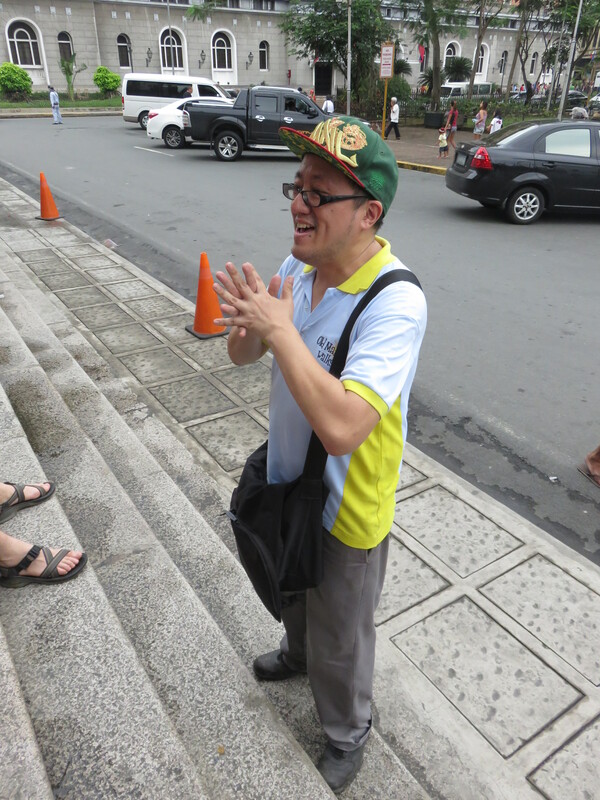 It was a tour organized by Old Manila Walks and we enjoyed it very much. We were a rather large group of 22 people and as diverse as possible. Still we made a good time together and learned a lot about the old Manila. 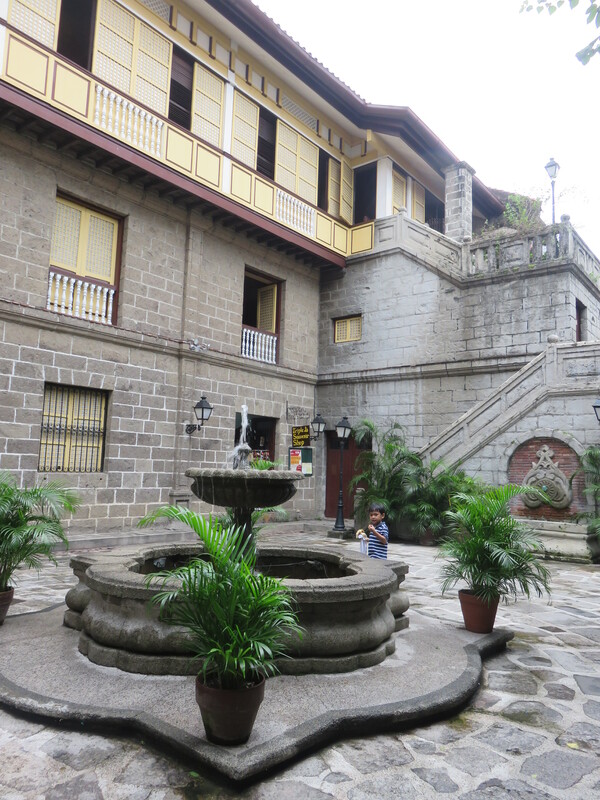 Intramuros (within the walls) is the name of the old Spanish part of town. It’s walled in to protect the from the old Pirates. The wall is quite solid and thick but not higher than one would think it could be easily passed over. That is where the old moat comes in. The whole of Intramuros was surrounded by a moat that the Americans later filled up and made into a golf course. The area of old Manila was not more than 50 hectares. At this time the Philippines where divided into small communities with 100-500 people per unit. No central government was in place when the Spanish arrived, but a new large community had grown up with about 2000 people and was called Manila after the flower Nilas who grew in abundance around the area. Now the flower is nowhere to be seen around the City. The Spanish came to a country with no good view of its social or political structure (meaning there wasn’t one), but sat down with the local tribal leaders of Manila and negotiated a peace. This was sealed by pouring blod from every member of the meeting into a cup, and then drinking that cup. You’re now of my blood and I’m of yours. Luckily we don’t so much of that anymore. The peace lasted only so long before someone blew something up. Locals blamed Spanish and the Spanish blamed the locals. Then the Spanish banned the locals to a place far away (1,5 km) and walled in Intramuros. By now it was of course time to build a church as spreading the Catholicism was one of three reasons for being here. Being near China and the Spice islands was the two others. Lots of trade to be had by these two, and it’s good to hide some of the greed behind religion. St. Peter – an old friend I met with the Pope once. The Cathedral of Manila was first built out of grass and wood, and in all honesty was probably not called Cathedral. It’s been rebuilt 6 times and are now in a version 7.0 that also includes air conditioning. Though it is highly expensive to make them turn it on. It has been destroyed by earthquakes and by war. This is where the Japanese hid in the last days of the war and committed some bad atrocities towards the local population. We’re talking mass murder of civilian population. The church itself is beautiful with locally made glass paintings. The Pope himself will be here in January 2015 and they’ve already starting planning of the extra seating necessary. This country is “more religious than the pope” so I guess he looks forward to coming here. As we waited outside the church for the guide two local thugs passed by on a bike. The number of times they crossed themselves and kissed their own hand was impressive. It was like looking a substitution in a Spanish football match. I guess a religion where you confess and get redemption is a nice religion to follow when you’re hustling. Outside of the church is Plaza Roma, which sounds more grandiose than it is. There is a statue of King Juan the 4th there. Under Spanish rule no recent ever set foot in the Philippines,but this guy made sure that all the Spanish provinces got inoculated against the small pox. A rather great feat when you think of the fact that there were no refrigerators and airplanes. I put the vaccine in you, send you to Mexico, withdraw blood and put it in the next guy every 14 days, repeat til finished. When it took 9-10 months on a boat to the Philippines from Spain you can see the magnitude. And they had to go to the west, the Spanish, as they had divided the world between themselves and the Portuguese. West for Spain, east for Portugal. But what about Columbus, you might think. Didn’t he go West to find the East? True, in 1492, whereas this treaty, the Treaty of Tordesillas, was sealed in 1494. Bet you didn’t learn that in school. We moved on to the wall and got some nice architectural info about the rebuilding of the old houses. A lot of them has been destroyed over the years but are rebuilt with a facade that resembles the old ways. Then we moved to the church of St. Augustine. This church is the oldest around here and has been here for more than 400 years. It’s built on a “Dutch foundation” of logs that are placed in the muddy earth. This makes the church “Immune” to earthquakes as it can sway without destroying the fundamental structure. It also holds an impressive museum. We went inside and got to see some great paintings, garments worn by priests and cardinals, ivory carvings and much more. A photo ban inside makes for good memories and few pictures. Some places where photography allowed and we got a few nice ones here. Take a look at that chair Katja is sitting in. This is the old stools of the upper class. Even when you’re supposed to stand during the service it’s a little fold in the chair that makes standing that much easier. Cheaters. Old, and hangs unprotected. You don’t mess with God! We ended the tour in Casa Manila, a house built in 1980 looking like its from 1890. And they have placed old authentic tic furniture inside. The rooms are informative and it was cool to see, but it was strict regulated and again- no photos. The Americans ended the Spanish rule over the Philippines when they attacked the Spanish in several location close to the US. They did not do that to liberate the Philippines, but to use its power for colonialism. Read more about that here in a brief but well written page I found. The American colonization will have to wait for another day. Since we did not have lunch before the guided tour because of the traffic we were now closing in on “angry hungry mode”. We therefor just sat down at the restaurant at Casa Manila and ate a late lunch. Just got served. Take the damn picture man, I’m hungry! Categories: Philippines | Tags: Culture, Manila, Martial Arts, Philippines, Yoga | Permalink.